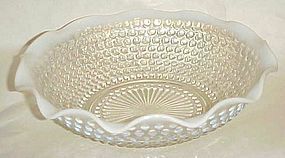 ANCHOR HOCKING depression era LARGE RUFFLED BOWL, 9 1/2", in the MOONSTONE Pattern. This was produced by the Anchor Hocking Company, from the early to mid 1940.This is very pretty and in excellent vintage condition! The hobnails and rim on the bowl are smooth with opalescent color. No cracks or chips. very nice.